Delimobil became the second car sharing service to expand to the Skolkovo innovation city on Wednesday, signing a strategic partnership agreement into the bargain. A Delimobil car parked in front of the Skolkovo Technopark on Wednesday. Photo: Sk.ru. Drivers will be able to pick up and drop off Delimobil cars at two Skolkovo locations: the Skolkovskaya and Technopark car parks. Under the strategic agreement, by 2020, Delimobil plans to make a fleet of electric cars available at Skolkovo, in keeping with the innovation city’s pledge to ban cars running on internal combustion engines (ICEs) by the time the city is completed. “We often say that car sharing is the transport of the future, helping to unclog roads and improve the ecological situation in cities,” said Leonid Sysoev, CEO of Delimobil, which operates more than 2,100 cars in Moscow alone. “As a federal operator and the biggest player on the car sharing services market in Russia, Delimobil is interested in the development not only of convenient and accessible transport projects in the country, but also that they should be innovative and ecological. The strategic partnership with Skolkovo shows once again that modern cities are not only ready for these kinds of solutions – they need them,” said Sysoev, adding that for people working and living at the innovations hub, renting a car via their smartphone is second nature. 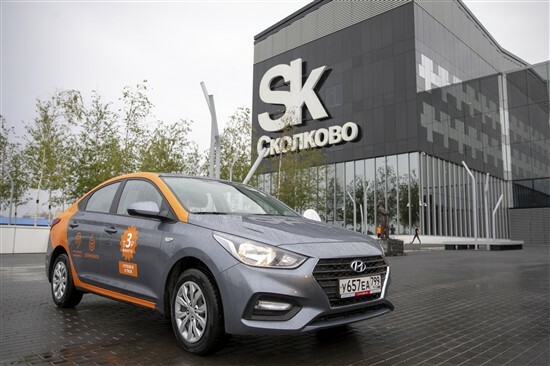 The first car sharing scheme to reach Skolkovo, BelkaCar, launched its service to and from the Skolkovo Technopark in May last year, and quickly became popular among those who work at the innovation centre. “For Skolkovo, as an innovative environment, it’s always important to give consumers the chance to choose among the best offers on the market,” said Maxim Sheifel, vice president of the Skolkovo Foundation and its city manager. “The appearance of zones where drivers can pick up and drop off Delimobil shared cars at the Technopark and Skolkovskaya car parks will increase the range of transport options for getting to and from the innovation centre,” said Sheifel. “Crucially, together with our colleagues from Delimobil, we are continuing to move towards the development of a car sharing service using electric cars,” he added. The company already has experience of setting up an electric car sharing network, having signed a three-way agreement to do just that with Renault Russia and the administration of Russia’s Krasnodar region during the Russian Investment Forum in Sochi this year. The service is due to be launched by the end of the summer. Delimobil cars can be rented from upwards of three rubles per minute. The company, which is present in other Russian cities including St. Petersburg, Yekaterinburg, Novosibirsk and Nizhny Novgorod, will also work with the Skolkovo Foundation on introducing innovative solutions created by the foundation’s resident startups to the company’s activities. The company also has plans to expand its scooter sharing service to Skolkovo, which already has one such scheme in place operated by Skolkovo residents Samocat. Skolkovo also has a bike sharing scheme that residents and visitors can use to get between the Technopark, the Skolkovo Institute of Science and Technology, the innovation centre’s car parks and other sites.